We usually pick our own travel itinerary for vacation but opted to try something pre-arranged for this year. Gani’s officemate won a package tour for 2 to Bohol and sold it to us by less than half of the actual cost. (sweet!) The package included a round trip ticket to Tagbilaran with hotel transfer; 3 days / 2 nights accommodation in Panglao Island Nature Resort & Spa with buffet breakfast & dinner; and a day tour to Bohol’s finest destinations. • Enjoyed swimming in the clear water during high tide from 8-11 am. The powdery sand was so nice to the feet. The little islet in the resort have many fish behind it that serves like a little snorkeling area. • Buffet breakfast and dinner were awesome and most of the food we tried were delectable. I definitely ate more than I used to during our stay. 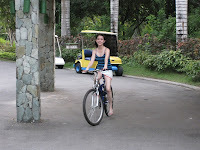 • Relaxed with nature’s fresh air, green surroundings and the Filipino-inspired ambiance. We also went to the cave inside the resort called Cambagat. 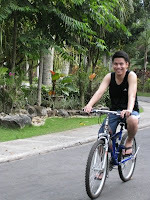 • Got the chance to ride a mechanical bike after so many years. Fun to experience once again that balancing comes out naturally. • With the Bohol day tour, we felt like it was an exclusive tour and didn’t expect that it was only the 2 of us with the tour guide himself. The good side was that time was in our hands and we didn’t need to wait for anybody. We experienced traveling in zigzag road with 70-90 kph speed! And even we’re speeding, it took us 2 hours to reach the Chocolate Hills (one way). Another part that I liked was the Loboc River cruise with free lunch. It only lasted for 1 hour and I still wanted more. Other places we went to were the more than century old Baclayon Church, man-made forest, Raja Sikatuna’s shrine and of course, meet up with the Tarsiers. Although tarsiers were not supposed to be touched to avoid stressing them, I pitied the tarsiers coz instead of taking the usual rest during day time, they got no choice but to be awake due to people like us who like to see them. • On our last night, we had an hour of “Simply Relaxation” massage. I don’t get regular massage and so far, it was the best that I’ve tried. All we did there was to unwind and enjoy the simple perks from this vacation. We’re like expectators moving from one place to another. And both of us agreed, this is the type of vacation we surely prefer. wow sweet naman vacation. happy anniversary and happy mother's day!! !